Praised by parents, who say it's especially valuable when getting children to talk about the day's triumphs and troubles, and by professionals, who use it in pediatric clinics and with the developmentally disabled and emotionally troubled. Janan Cain's kids ooze anger and bounce with excitement as they teach the words for emotions. Feelings come and feelings go. I never know what they'll be. Silly or angry, happy or sad-- They're all a part of me! * * * Romp with your child through this delightful word book of feelings. 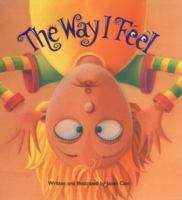 The Way I Feel is a wonderful addition to any child's library of books that explain the world out there, as well as the world within. Picture descriptions present.